The first time I heard this song, I was flying home from a conference in Jacksonville, Florida. This seems to be my thinking time, while I am in the air…unplugged…no distraction…just me, my heart and my thoughts. I was feeling lost, broken inside…still. I thought about that first flight I took after John passed away, it was to Jacksonville, Florida. I had anxiety over this trip back there, I was remembering all of the feelings I felt then, but they were still there..though less fresh with the time and ever present healing…they hadn’t left me. That trip in 2006, I wanted to hear the waves, somehow escape my reality. I was lost then, deeply broken and bruised…how frail and misguided I felt inside. Outwardly, I was pretending, being strong for everyone else. Inside I was hollow. How come, on this trip back 9 years later I felt the same feelings? From that flight to this one 9 years later, brokenness…wasn’t it supposed to get better, get easier? Didn’t everyone tell me it would? How could they know that, really? People say things they think will help you, I get it…but I want the brutal truth and honesty. It doesn’t get easier! You shared a life, you were building a life, you said goodbye with no choice…its just not easy. You do eventually re-enter and re-build, finding new joy again. I have found new joy, new life, received new blessings. I opened myself to it and for me, my journey of healing was sharing, keeping Johns memory alive, remembering all that he was to me and others and being thankful he showed me how to really live and love. Honoring him and myself was never a question, I knew I needed to live and be happy. That is what he would have wanted for me. I had started living, I had re-built, I had made my life good, I was determined..yet I was still sad. I carried scars, I had buried tears…buried them in vain because the pain was hard. I don’t share with people that I have nights I still cry in my sleep, nights I think about what my life would have been. This does not mean in any way I am not thankful for what I do have. It is just the life of a widow. I’m so blessed, my tears don’t mean I don’t love my second husband or that I don’t feel the blessing of being a mother to my amazing girls. I cry for what I had to say goodbye to, but I cry for being thankful for what I have because of it, the new course my life took does not diminish what I had. I feel lucky to have the love and hearts of two men, the love of two beautiful and kind children. I know I am blessed despite, my loss. I pray for you who may be going through this. I pray you receive blessing through loss. I think for me, knowing how much time had gone by scared me. How fast life was moving, was hard to believe. I was so very thankful for the blessing of my new life, my new husband, my two daughters, the beautiful home we made together, the career I had worked so hard for, the picture of normal…the normal I was seeking, but I didn’t feel normal. What was normal? Was this my normal, getting further and further away from the time I last spoke to John and saw him…was normal knowing I continued loving him while also loving my new husband. How was this all normal? I needed the ocean then and I needed it now, the waves crashed over me then and they were crashing over me still. Scars, they were left on my skin. I was stronger, but I felt weak. This song came on in flight and I felt, it was a gift. It is a message I continue to hear through the waves of my journey. I have so much more ahead of me to do in this life. My feet may fail, but my faith will stand! I know its ok to carry and share my scars, they are ME. My scars are personal and I will carry them my entire life, I want to! I carry and share these scars so others know, that I LIVE and choose to LIVE. I want people to know. I learn something new every year and I am PROUD! Im proud of John and who he was. I’m proud of the love we shared. I’m proud of the scars I bear, I’m proud I’m not afraid to speak about him, who he was to me and about my journey. I’m proud of my second husband, Dave and how he loves me never once worried about my scars, my healing, the life and love I shared before him that ended without my choice. How he continues to love me through it. He may not understand, how could he. He does however, love my posts and recognize the days that are hard…saying “todays Johns birthday, I saw your post, how are you?” I’m proud that through our journey and the trials we have faced, we have kept working on us, we know we aren’t perfect, but we have learned what we have is worth fighting for, working on, we don’t pretend we have perfect, we are open that we have lost site of our marriage at times and who we are to each other. This to me is real life, real marriage. Picture perfect, is not always reality. Love takes work, takes time. I’m thankful for your love Dave and the life we are living together. No one needs to understand that or us, because this is our life. So, thank you for following me…for listening to my heart. I hope this encourages you in your journey knowing there are many waves and many blessings ahead. Open your heart to really living without borders. Now, you must do me a favor and turn this song up…LOUD…feel the words and how they speak to you! MY VERY FAVORITE PART IS IN CAPS, below. You call me out upon the waters, the great unknown. My feet may fail..and there I find you in the mystery, in oceans deep…my faith will stand. And I will call upon your name…and keep my eyes above the waves…when oceans rise…my soul will rest in your embrace…for I am yours and you are mine. Your grace abounds in deepest waters. Your sovereign hand will be my guide. My feet may fail when fear surrounds me, you’ve never failed…and you won’t start now. So, I will call upon your name…and keep my eyes above the waves. When oceans rise, my soul will rest in your embrace….for I am yours and you are mine. 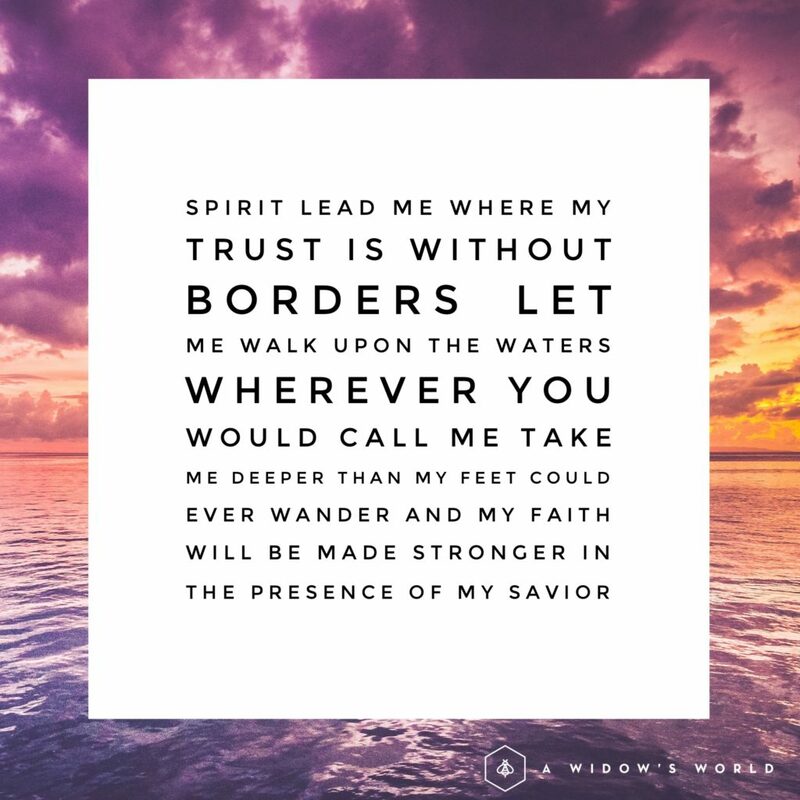 SPIRIT LEAD ME WHERE MY TRUST IS WITHOUT BORDERS, LET ME WALK UPON THE WATERS WHEREVER YOU WOULD CALL ME. TAKE ME DEEPER THAN MY FEET COULD EVER WANDER AND MY FAITH WILL BE MADE STRONGER, IN THE PRESENCE OF MY SAVIOR. My feet may fail, but I will at least know I followed my heart by really living and choosing to live, how could I fail!